D-FOG is disbursed by, and uses the effluent as a delivery agent. It attaches to the grease molecules, causing the FOG to become water soluble, and binds the FOG molecules to the effluent until all are digested by the naturally occurring bacteria which are drawn to the negative end of that pairing. D-FOG does not interfere with the natural digestion process nor introduce another strain of bacteria into the system. It is 100% organic; it is actually a food for the bacteria. 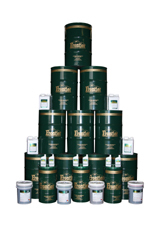 D-FOG is not affected by accidental or rogue introduction of petroleum hydrocarbons as some enzyme/bacteria cleaners can be; it simply keeps the FOG molecules in suspension and more available to digestion by the resident bacteria. D-FOG breaks up and suspends solids; unlike enzyme/bacteria additives, solids blankets are no longer a problem. This means that resident bacteria can do a more thorough job of digestion of the suspended solids. Place 20 oz. of D-FOG into one gallon of water in a pump-up type garden sprayer. Spray all affected surfaces, blankets, walls, floats, pumps, and anything else that is affected or causing an effect. Spray a six-foot diameter of area with one quart of mix for each one inch of FOG depth. (Four inches of depth equals one gallon of mix. Eight inches equals two gallons of mix etc.) Apply twice a day, preferably at the lowest level to allow dwell time or agitation from incoming effluent before the next pump cycle. Follow this procedure for at least three days. If there is anything left, or if there appears to be no change (as when dealing very thick blankets that are old and dry), break up with a stiff water stream and repeat if necessary; it should then pump away, leaving the lift or well with a significant improvement. Then once a day place 10 ounces of D-FOG in five gallons of water, throwing at any accumulations. The natural agitation will keep the lift clean. Unless you have is an extremely high volume or velocity application for the sizes indicated or your lift has been neglected for some time, there should be obvious improvement after three to five days. Photographs will reveal changes which may be missed by the mind’s eye. Where a sanitary tee is encountered, extra time is required for the same results due to the lack of agitation. Some dilution of FOG on screens and in the scum basin at the plant should be seen in four to seven days. As long as at least one part of D-FOG to two million parts of effluent is maintained the lift station will keep free of FOG as long as D-FOG is used. D-FOG at a minimum. Equipment needed is all off shelf so there is no need for exotic hardware, facilities, or handling precautions. Values shown here are typical, and may vary.